Derbyshire Redcaps were common on British farms until the middle of the 20th century, particularly around the southern Pennines. They have never been preferred by intensive farms or commercial operations, and have always been primarily a barnyard fowl. Today, they are a very rare chicken, with the largest numbers still residing in their home country. The Rare Breeds Survival Trust of the U.K. lists them as Vulnerable on their watch list. They were admitted to the American Poultry Association's Standard of Perfection in 1888, and are listed as Critical on the American Livestock Breeds Conservancy watchlist. Derbyshire Redcaps are a hardy, active breed of chicken that does well in free range conditions. 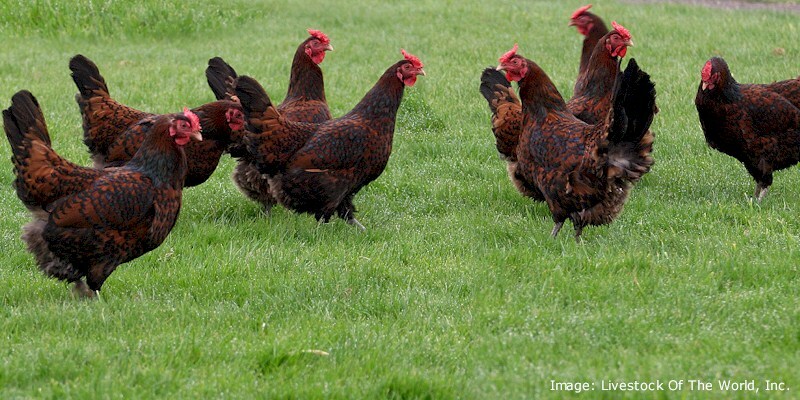 They are well suited for dual-purpose farm flocks, being used for both meat and egg production in addition to their ornamental qualities. Hens do not usually go broody, and lay a good amount of large, white colored eggs. Redcaps are classified as a light fowl, with roosters weighing approximately 3.4 kilograms (7.5 lb) and hens 2.75 kg (6.1 lb). Their beaks are horn-colored and their combs hang to either side of their face. They appear in a single variety of plumage, with various dark hues of red, brown and black. The Roosters display a greater diversity of color, but both males and females have black tails and a crescent shape of black on the edge of most body feathers.